One winter day, after having pegged away most of the day with sundry errands, I was fagged but still had to face the daunting task of cooking as dinner time drew near quicker than I knew it. Thanks to a brainwave, I had a solution. 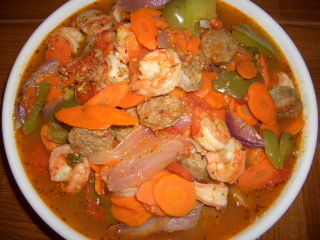 Opening the freezer and fridge, I took out some Italian Spicy Sausage, shrimps, green pepper, red onions, tomatoes and carrots, and worked away on this one-dish meal. It turned out a success! *1 green pepper, 1 medium red onion and 4 carrot sticks: all cut into sizes and shapes you desire. 4 fresh tomatoes: squshed. *2 TBLS of Veggie/Olive oil, 1 clove of fresh garlic thinly sliced, 1TS salt, 1/8TS ground pepper and sprinkle of Italian spice (optional). *If sausage uncooked, boil/pan sear till mostly done and put aside. Repeat the same to Shrimps. * Heat up oil in skillet at medium, add in garlic, sear the garlic for 30 seconds, and stir once half way. Add in onions and carrots and cook till desired softness, 6-8 minutes. After seasoning with salt, pepper and Italian spice, pour in sausage, tomatoes and green pepper. Cook till sausage is thoroughly done (5- 10 minutes). At last, add shrimp to the mix and cook till boiling. Serve over rice or pasta, etc. Enjoy! I love lobster and sautéing it the Cantonese fashion is my favorite. * 1/2 medium cabbage, cleaned and cut. * 6 Oz dry Honey Suckles, soaked in water for 2 hours, rinsed and drained. * 6 Oz Wooden Ears, soaked in water for 2 hours, cleaned and cut/snapped into smaller pieces or left whole. * 1/3 can Preserved Mustard (榨菜), rinsed and shredded. * Cooking oil, salt, soy sauce, sliced fresh garlic or minced garlic and ground pepper. * Pour 3 Tbsp cooking oil into pan and heat at medium for 20 seconds, add cabbage, sprinkle a little salt and cook for 10 minutes, stir every few minutes. Remove cabbage from pan and set aside. * Pour 2 Tbsp cooking oil into pan, stir in garlic and heat at medium for 20 seconds. Add Wooden Ears, leave in pan for 3 minutes, stir occasionally; mix in the Honey Suckles, leave in pan for 7 minutes and stir occasionally. * Transfer the cabbage back into the pan, mix in Preserved Mustard; season with 1 and ½ tsp salt, 1Tbsp soy sauce and ½ tsp ground pepper; blend all together thoroughly. Leave in pan for 5 minutes, stir once or twice in between. Remove from pan and serve. Ta-dah, you have yourself a delicious and salubrious veggie dish. Chinese believe that Wooden Ears have the wonderful ability of thinning blood and therefore preventing blood clotting. * A box of Tofu, cut into ½ inch cubes. * 4 or 5 of black or Hiatus mushrooms, soaked in water for 2 hours, rinsed, drained and sliced. * 4 or 5 Green Onions, washed and cut into small rings. * 3 Tbsp spoon Cooking Oil, sliced fresh garlic or minced garlic, 1 tsp salt, ½ tsp ground pepper and 1 Tbsp soy sauce. Optional: Dry red chili pepper. * Pour 2 Tbsp cooking oil into pan at medium heat for 20 seconds or so. Add Tofu, (remember to empty out the water that seep out of the Tofu into the container before you pour the container into Pan), and spread them out evenly. Pan sear at medium heat for 5 minutes or till lightly brown, sprinkle lightly some salt. Repeat the same with the other side. Remove Tofu from pan and set aside. * Pour 1 Tbsp cooking oil into pan at medium heat for 20 seconds or so. Add garlic, and Chili pepper if desired, heat for another 20 seconds before adding in the mushroom, mix well. Cook for 5 minutes or till softened enough, stir once or twice. * Transfer the Tofu back into pan. Add salt and soy sauce (you can add ground pepper at this time if you don’t use Chili Pepper). Mix all together to blend well. Stir in the green Onions for a minute before removing from pan. I was born on Hainan Island, China and love seafood. To me some simple and great way to cook catch of the day fish is to pan sear, salt and pan sear with little oil and maybe some dry red chili pepper on low fire till the fish is golden brown, or steam the fish with fresh ginger and garlic, garnish with green onion then season with sesame oil and soy sauce before serving. Mmmm, it is simply the best. With frozen fish however I would add some toppings to the pan seared fish. Here is to share a few toppings that are very much loved by my family. 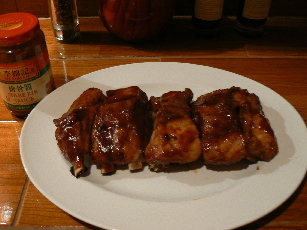 My family and friends love these ribs, especially when they are fall-off-bone tender. The good thing, they are easy to make. Here is how.